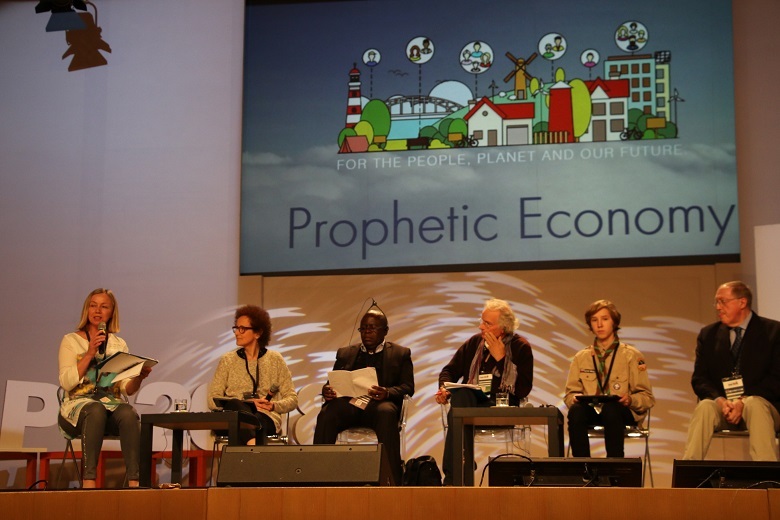 Last November, a delegation from ATD Fourth World participated in an international gathering on “Prophetic Economy”* held in Italy. This gave rise to the idea of inviting multiple organisations, often very small ones, to take part in a discussion of best practices. Five hundred participants from all over the world, including many young people and even children, attended the event. ATD was intrigued by the invitation especially as its Common Ambitions include promoting an economy that respects people and the planet. ATD Fourth World is committed to the idea of an economy that respects the dignity of each individual and encourages sharing, solidarity, and cooperation. Representing ATD at the gathering were people involved in the “Working and Learning Together” (TAE) project, the president of ECCOFOR, an education and training program that collaborates with ATD, and three members of the ATD Volunteer Corps. The opening round table began with an overview and analysis of the current situation. During this event, a member of the ATD Volunteer Corps talked about his experience in France and Guatemala, highlighting the power of the human economy. The market economy, he explained, expels from the labour market men and women living in extreme poverty. He told a story about a women from the Democratic Republic of Congo who worked as a porter. This woman had a neighbour who lived in even worse poverty and who asked for help. Rather than simply giving her neighbour money, the porter decided to share her workload – and therefore her income and resources – with this neighbour. The 135 initiatives presented at the gathering demonstrated the many ways that humble and modest activities can often create significant change. The NGO JEVEVEV in Benin, for example, presented a project implemented in its community. Residents saw the nearby river getting covered with a particular type of vegetation, the “river hyacinth”. This vegetation was proliferating due to climate change to the point where canoe traffic became paralyzed and the very existence of the community was compromised. However, residents discovered that these plants could provide the raw material for excellent compost, which soon replaced all chemical fertilizers previously used. The community also discovered that the river hyacinth could be used to make paper, mats, and other useful products. A plant that had been a symbol of death became a tool supporting life and development. Such useful economic practices already exist, but they are often invisible in the media and to others. Increasing recognition will enable them to become more widely used. Towards the end of the gathering, ATD delegate from Italy, Jean Tonglet, emphasized the need to consider the opinions of people who do not have a place in the dominant economy because of social exclusion. Too often these women, men, and young people are not consulted when economic issues are discussed. No one asks about their experiences and their life skills. Their knowledge and perspectives are not valued or even recognized. The result, Tonglet insisted, is that people who are actually quite competent remain the objects of other people’s ideas, studies, and research, when in fact they wish to be recognized as subjects in their own right, capable of thought and analysis. “We must imagine new ways of coming together and communicating that allow people with a personal experience of economic and social exclusion to participate in these discussions in a more meaningful and less symbolic way.